This is a milestone post – the very first of the Shortlists’ storied existence that hasn’t been written on my 2009 MacBook Pro. The old girl can’t handle much excitement these days so processing and publishing a crumb cake recipe was out of the question. Finally downloading the WordPress app on my phone should mean that I post more often and definitely get carpal tunnel. It’ll be worth it. It’ll also mean the formatting may be all off. Win some lose some. Beyond degrading technology, I haven’t posted because we’re all suffering from the daycare disease – endless runny noses, head colds, dry coughs, and general grossness. Vesper, who’s crawling and pulling herself up to standing, seems unfazed by the constant nasal drip. Me? Not so much. My true talent of complaining incessantly is reaching Olympic levels. Weeks into my Complain Marathon and what do I have to show for it? I can now breathe exclusively out of my mouth for days on end. I can maintain a scowl throughout an entire SNL Trump cold open. Eric and I can effectively communicate through nothing but grunts and shrugs. So essentially, nothing. I have nothing to show. 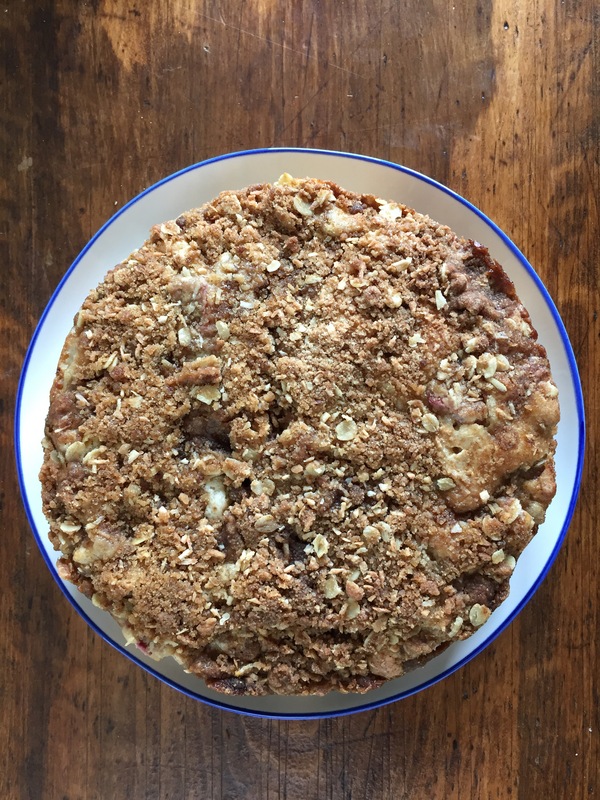 Except, of course, this amazing crumb cake! It’s springtime in London according to the calendar but not the thermometer. (Another complaint!) Rhubarb is just about in season so I jumped joyfully on the bandwagon. Hoping the springtime bandwagon would bring warm weather and an end to my cold. (Spoiler alert: it didn’t.) 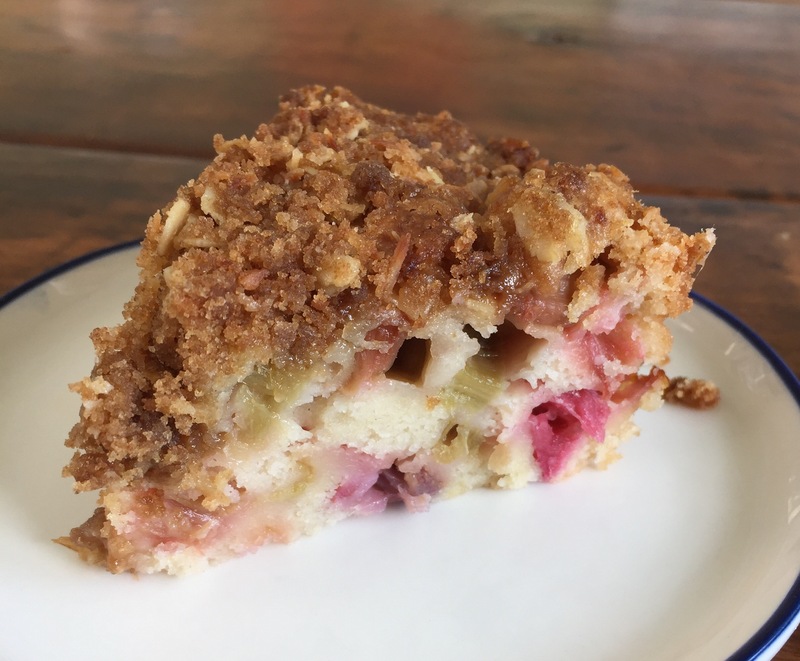 I asked the internet for help with how to showcase rhubarb and the internet delivered this delightful cake, which I seriously can’t get enough of. It’s the only non-human thing that can reliably erase my scowl. Serves 8 – 12. The original Recipe is by Bob Vivant and published at Food52. 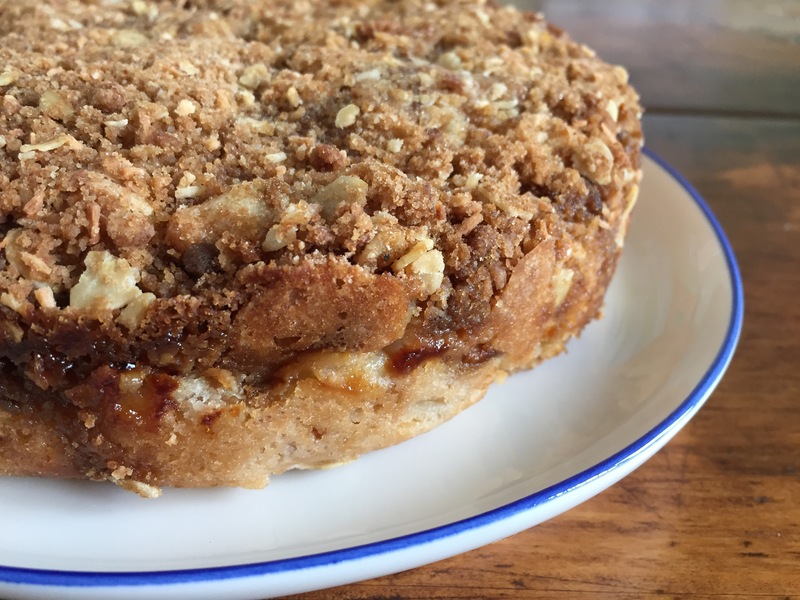 I adapted it liberally but still is moist and scrumptious with just the right hint of almond. It could showcase any fruit really but the rhubarb’s sweet tartness really shines through. It’s definitely going into my everyday cake rotation. Perfect for breakfast, tea or dessert with sweetened whipped cream or ice cream. Butter the bottom and sides of an 8-inch, deep tart pan / 8-inch round cake pan or 2 7-inch cake pans. For the crumb, combine the dry ingredients in a small bowl. Using a fork or your fingers, gently work in the butter until pea-sized lumps are formed. For the cake, combine the eggs, sugar, salt, and almond extract in a large bowl. Beat on high until the mixture triples in volume, about five minutes. Fold in the melted butter, flour, and rhubarb. Evenly spread the batter into the prepared pan. Sprinkle the crumb topping evenly over the top. Bake for around 60 minutes (more or less depending on pan size), until the topping is deeply golden and a toothpick inserted into the center comes out clean. Remove the cake from the pan when mostly cool.